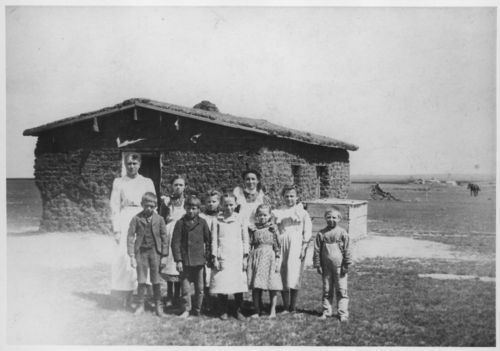 This black and white photograph shows a group of students and their teacher standing before a sod schoolhouse located about ten miles south of Colby, Kansas. Some of the students have been identified in the back row from left to right: Allena Snell Council, Eda Williams Gird, Nancy Williams, Josie Gird, Richard Gird. The front row from left to right: Loren Orval Snell, Roger Williams, Myrtle Patton Gird.